I actually kept a human anatomy model for Ar (2.5 years old) when he is a bit older but he always dragged the box out of the closet. Therefore, I made the human organs sensory bin to satisfy his curiosity. First, he pinched and squeezed the water beads. He is not interested in the organ models. Second, he made as if the large intestine is a maze for the water beads. Third, he took the organ I called out. Fourth, he he ran through his pool and threw the organ I mentioned in the pool. I introduced human organs through three-period lesson and we continued doing racing game. I call out an organ, he took it, ran to his pool and throw the organ there. we did it until all of the organs were thrown to the pool. i downloaded the cards from suzie's blog. To make it more dramatic, I poured some jelly into the human torso model and let it cool. Ar was ready to do an autopsy towards that body. let's call it autopsy because he might not return the organs on the right place as it is in a surgery. He cut open the 'flesh' and carefully took the organs one by one. 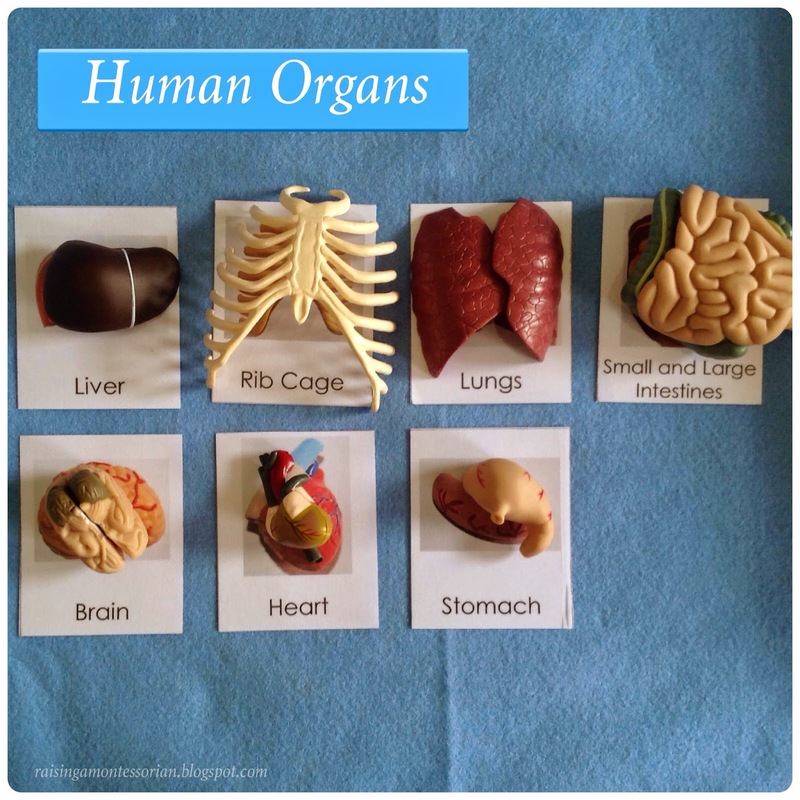 He named them and asked what certain organs were for. We had serious discussion and he repeated the functions as if he was explaining to someone who hasn't known the functions yet. Tweezers are great tool in this activity. They can strengthen the fingers and hand muscles so that children are ready to write. In the end, sprinkle some glitters onto the bowl of jelly to create a magical sensory play. Ar squeezed the jelly and he said it was wiggly and wobbly. Another thirty minutes were spent well. 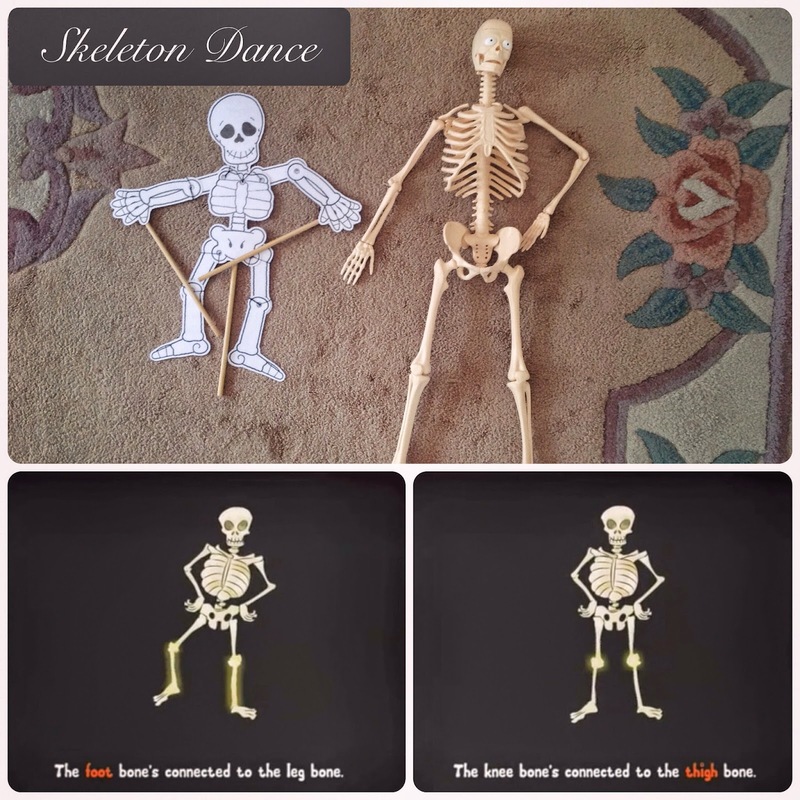 Since he likes 'Skeleton Dance' song by Super Simple Song lately, I made a skeleton puppet and introduced parts of the skeleton. I haven't discussed about the scientific terms of the skeletons yet. As long as he knows that the bones are connected to each other, that's enough for me. 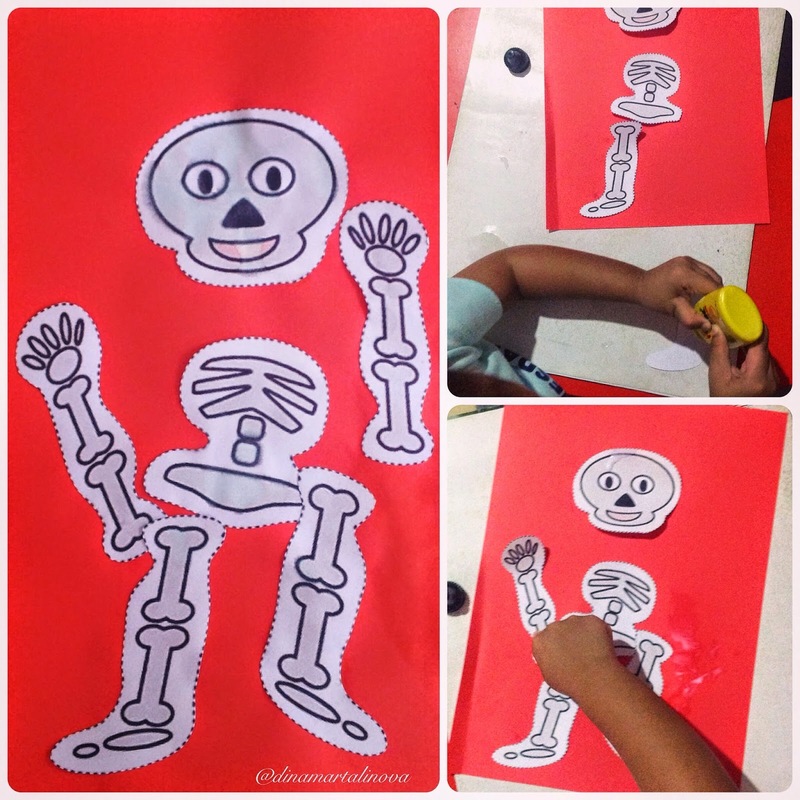 I cut parts of the skeleton, Ar glued and pasted them on a piece of paper. He could placed them in the right position though he still had difficulties in coordinating his hands when putting them on the paper. This activity is good for hand-eye coodination. Older children can cut the skeleton themselves. Ar watched the videos about study guide to the system of the body here because they are attractive. I read the articles first before I told him 'the story' about human organs.